Jan Estep, "Who’s Afraid of Conceptual Art?” Quodlibetica, Constellation 07: Fakes and Fabulations, April 2010, reprinted in Quodlibetica, Constellation 21: Something Old, Something New, September 2012. Keith Arnatt, Trouser Word Piece, 1972, black-and-white photograph. I’ve been thinking a lot lately about why so many people do not respond well to conceptual art or to any art that is not explicitly tactile, visual, and emotive. Though every work of art involves both concept and materials, as a general definition conceptual art is art in which the idea is more important than other aesthetic and material concerns. In other words, the idea or concept motivates the work more strongly than a formal exploration of traditional artistic materials. This often leads to works that rely on language, context and back-story, a mixed bag of contemporary media, and after-the-fact documentation for impact. What get deemphasized are visuality, material presence, “the artist’s hand,” and masterful demonstration of specific formal techniques. This leaves viewers high and dry if they are looking for something more craft- and labor-intensive, sensuous, and overtly emotional. I am always surprised by the vehemence of these attacks against conceptual art, the need to establish superiority over such work. I understand that something that doesn’t depend on craft or disclose its intentions too readily can leave a viewer in the dark as to how to judge it. Arguably it is difficult to appreciate the intellectual labor of the conceptual artist, which is invisible compared to traditional craft-based processes. And post-studio practices look a little too much like ordinary life or like other disciplines for them to be easily considered art-like. For all of these reasons viewers can feel ill prepared for the kind of thoughtful engagement and work that conceptual art asks us to do. However, while taste is subjective and conceptual art is not for everyone, I do not understand the ill will. Even if someconceptual art is insincere, unemotional, playing the system or a ruse, these kinds of work still have their place and these adjectives don’t describe all conceptual art. Moreover, you can find exemplars of insincerity et al in every kind of art. Given this, it’s amazing that others feel entitled to belittle conceptual art purely on principle, as if certain kinds of creativity are just not acceptable. “I don’t like this” or “I don’t know what this is” turn into “It doesn’t have the right to be called art” and “That person is not a real artist.” The hostility seems out of place, particularly when coming from other artists who embrace creativity as a life-path. The bulk of the problem stems from overly narrow assumptions about what art should do and what it can look like. I want to focus on the expectations of artists for a moment, because if even artists have trouble accepting conceptual art, it’s no wonder non-artists do. At the risk of stereotyping what I call the conservative, anti-conceptual position, one that desperately tries to stave off the negative tendencies of conceptual art, in the following I draw out that position in its most reductive form to better set up the contrast. While most artists do not adopt the extreme version of this kind of intuitive, instinctive, anti-intellectual artist, it clearly reveals the value differences at stake. I would also add that whether or not embraced in its entirety, its subtle influence permeates most, if not all rejection of conceptual art. Conservative, anti-conceptual (CAC) artists believe that art should be hand-made, with the artist’s craftsmanship and mastery clearly on display, as if technical proficiency alone validates someone as a “real” or “good” artist. The flipside of this assumption is the belief that the medium itself determines whether or not the art is “honest” or “sincere.” So, for example, painting, good; industrial fabrication, bad. Analog, good; digital, bad. Unique object, good; serial multiple, okay; store-bought, found and/or mass-produced, definitely bad. The view also mistakenly assumes that conceptual art does not require skill, even though it takes just as much talent, imagination, and discipline to do well as any other art form. Contrary to the CAC artist’s position, whether or not a work is good or bad does not depend solely on the choice of medium, conceptual or otherwise; you can certainly appreciate something because it is hand-made—art is a rare field that honors the tactile, imaginative exploration of the senses and handwork—but making something by hand is no guarantee of authenticity, quality or meaningfulness; there is second-rate art in every medium. CAC artists believe that art should focus on emotional self-expression, with artists trusting their intuition to guide the process. There is something powerful about artists who explore their personal experience with a candor and perseverance that many of us lack and who share it with others in unique, material ways. Yet on this view “intuition” is radically dumbed down, turned into a raw instinct rather than a complex, informed, and decisive total-mind-body thought process. That intuition is mysterious and not fully in our control or conscious does not mean it is not mindful. This separation of mind from body, thought from feeling does a huge disservice to our understanding of creativity. It also means that on this view the expression of ideas doesn’t count as emotionally or subjectively expressive. CAC artists argue that “thinking too much” harms both the process of making art and the enjoyment of viewing art. From the artists’ perspective, artists who are overly analytical and self-critical in the studio often become inhibited and lose the ability to act. Or believing the work has to be made “smarter,” they end up trying literally to “put” ideas “into” the work, which overdetermines its meaning. Both happen quite a bit and both are dissatisfying. So artists find ways to “turn off their minds” when working, devising various strategies to trick themselves, so they stop questioning every gesture and impulse. “Quit thinking, and just do,” is the familiar adage. However, it’s not all thinking that needs to be silenced, just the overly self-conscious introspection that leads to a debilitating uncertainty or hyper intellectualized reductionism. Conceptual artists also have to find ways to stop the incapacitating self-consciousness and oversimplification, so this alone is not a matter of thinking or not thinking as a whole, but thinking of a particular sort. From the viewers’ perspective, art that makes them think too much often reminds them of school, in a bad way. As viewers, CAC artists don’t want to learn what conceptual art wants to teach. That’s not the aesthetic experience they are looking for. In their view art should be cathartic and affective, or phenomenal and material. It can be about beauty, the sublime, or spectacle. Formally it can push the limits of a particular medium. In the great humanist tradition, it can put us in touch with our fellow man, woman, and child. But it should not be too political, didactic, discursive or too heady. I am not suggesting that conceptual art is always the latter, as it also can be poetic, ambiguous, deeply emotional, and embodied with compelling materiality. Nor am I suggesting that conceptualists can’t also have beauty, liminality, and empathy. But CAC artists are so accustomed to their own expectations that these qualities are never seen or felt when they view conceptual work. Above all, CAC artists want art that makes them feel, rather than think. However, they cannot tolerate art that makes them feel stupid, and this is conceptual art’s number-one insult. CAC artists tend to be profoundly anti-intellectual, based in part on the schism they drive between the heart and the mind. They are Cartesian dualists; feeling a split between the mind and the body, they favor the body over mind. For them the experience of not-knowing is disorienting, uncomfortable, and perhaps even a little humiliating; they don’t seem able to connect the physical with the conceptual or the bodily with the more abstract. Brought up short, they can’t confront the object before them with an open, curious attitude. But instead of letting go of their expectations and challenging the perceived dualisms that prevent exploration, CAC artists lash out in retaliation. 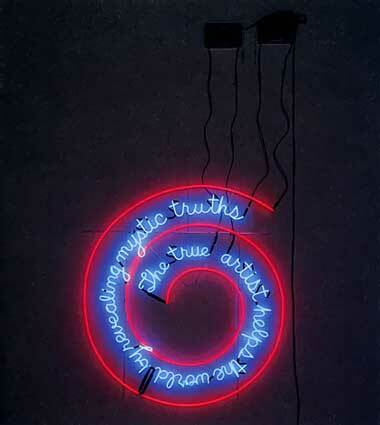 Bruce Nauman, The True Artist Helps the World by Revealing Mystic Truths, 1967, neon sign. In my efforts to explain the antagonism toward conceptual art I still don’t understand why it makes people so angry. I don’t think the anger is solely about competition for scarce resources, that is, because conceptual art gets critical attention in the press, institutional and financial support by museums and arts-granting agencies, and love and acceptance by some art viewers, all of which CAC artists would like to have for themselves. Although this may be a factor, there are simply too many artists who are unrecognized and undersupported by the art world for this to be the sole reason you would discredit other artists. It’s like attacking your neighbor for having a job when you do not; blaming her rather than the larger problem misses the mark. For me, the anger is evidence of some deeper feeling that I can’t quite put my finger on. Understandably conceptual art threatens the CAC worldview, but rather than entertain that difference, why the reactive and aggressive impulse to squelch conceptual art? The fact that artists disagree with one another about how they want to work or what they want to evoke does not constitute a personal attack on the CAC position. Each is just one possibility in a long continuum of artistic possibilities. Even my admittedly reductive characterization of CAC artists is not intended as a criticism of that view per se; the world needs artists to work in every which way we can, and the qualities supported by even the most conservative, anti-conceptual artists are undeniably significant and worthy. The target is the CAC-like tendency of some artists to disparage what they do not understand. As I said when I first set out to define the CAC position, most artists who are skeptical of the extreme forms of conceptual art do not thereby adopt the extreme form of anti-conceptual art either. They eagerly own ideas and nonformal content in their work, they don’t shy away from all intellectual engagement, they don’t consider their work purely motivated by feeling and emotion. In fact, most contemporary art is conceptually influenced, making it difficult to draw a hard and fast line between conceptual and non-conceptual practices. However, the point cannot be stated enough: in a truly democratic society there is plenty of room for alternative viewpoints. Standing on the moral, aesthetic high ground of conservative anti-conceptualism (CAC), and trashing anyone and anything that doesn’t share those same beliefs is counterproductive to the broader mission of art. For if artists cannot expect each other to take our work seriously, to engage with it respectfully, even if they end up disagreeing with the choices the work reveals, how can artists hope to convey the significance of conceptual art to an audience at large? You cannot simply whisk away the fact that conceptual art has been a major development in art history and profoundly influences contemporary art. To continue to actively hate the supposed enemy sadly shows a certain segment of the art world to be intolerant in ways that are utterly disheartening and contradictory. The common ground that we share should allow us to disagree without killing each other off.